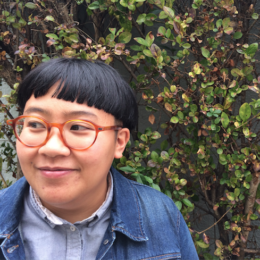 Born in Manapla, Philippines, Cheena Marie Lo is a genderqueer poet based in Oakland, California. They co-founded the Manifest Reading Series, which featured mainly queer experimental artists and writers. They currently coordinate a youth art program at California College of the Arts, and co-edit the literary journal, HOLD. Their first book, A Series of Un/Natural/Disasters is forthcoming from Commune Editions in April 2016.